In the new there was warning about snow storm coming. I wonder if it will be a really big storm. As much as I don't enjoy winter, I love to sit in front of the window, drink hot chocolate and look how fluffy, white snowflakes dance in the sky. It really calms me. From some time I was thinking about mirror photos of outfits. I don't find them too attractive, but still it's the easiest way to get some everyday outfit snaps. At the beginning I didn't wanted to post them here, but in the end I changed my mind. I really want to share here my everyday style, and taking this kind of photos takes only few minutes, without any unnecessary fuss. Also, at home I usually walk barefoot, but it would look a little bit wired in pictures, so I'm wearing shoes for photos hi hi. Yes, please show more such photos! Of course it is prettier to have them taken outside, with someone else taking them, but no one can do that every day and if it means we get to see more of your pretty outfits like this I prefer it this way! 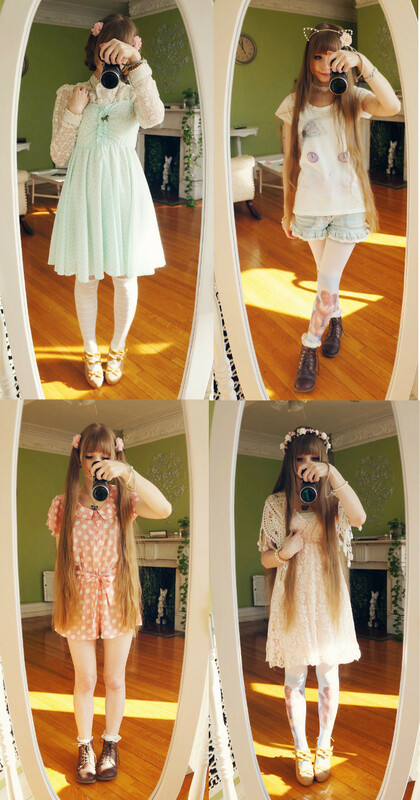 I love the forth outfit with the flower headband the most. So fairy-like! When I was younger and still lived with my parents, in our apartment was also very cold. I could wear only big, warm sweater to keep myself warm, and almost all the time, I was sitting under blankets. At this apartment the heating is awful. There's no good temperature control, because it can be only open or closed >__< And even when it's closed, there are some pipes with hot water on the wall that heat all the time. I like to see your daily photos. You and your outfits are really cute. I hope I'll be able to keep them interesting. This cat t-shirt is soo cute and easy to coordinate hi hi. You're so cute, I want to hug you and I'm not really a hugging person! Haha ^^ Your home looks beautiful in the photos. 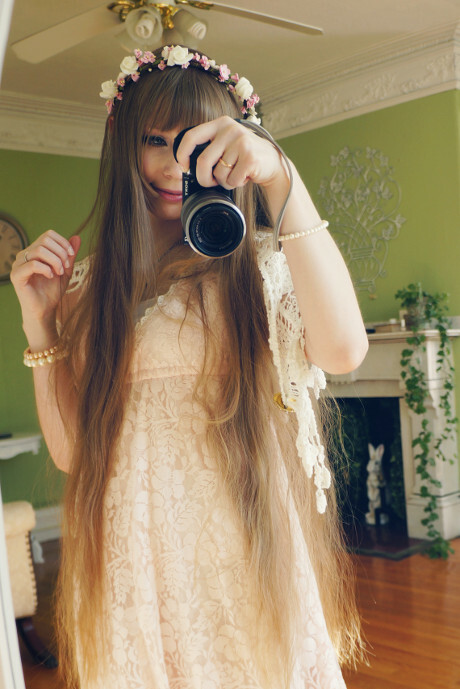 I think your mirror shots look enchanting, still. And I'm still envious of your hair! Now, I'll definitely try to post more of similar photos! Your looks are all perfect, I can't decide which one I prefer! Yes, please, post more!!! Your daily looks are so beautiful and inspirational!!! I'm really happy that you like them! My favourite look is the one with the lace vest and the flower headpiece!!! That must be because I love mori and fairies. Now, I'll definitely try to post them more often. Yes please! I love seeing your everyday style. I love it so much! It would be too cold for me here to wear any of these haha, I'm jealous! At my apartment is tooo hot! It's hard to control the heating and I often have to open few windows to cool it down a little bit. That one of the down sides of renting apartment in old mansion I guess. 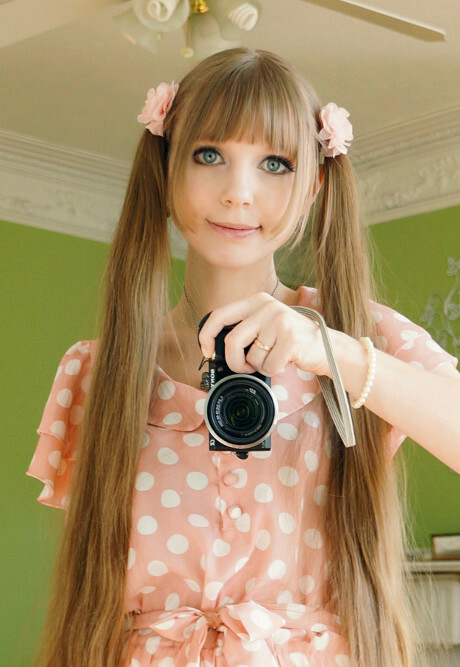 oh, please continue posting mirror shots, your style and beauty are definitely worth seeing even on this type of picture. your home decoration is also pretty, so the pictures turn out enjoyable to see anyway. I was trying my best to make them as clear, and nice looking as much it was possible! Yes, please continue! You're really an inspiration to me! I'd love to see your daily outfits! I especially like them when they're in groups like this, so maybe you could do this once a week? Lumi możesz mi proszę na maila selene999@tlen.pl wysłać adres do Was bo chciałabym przesłać Wam zaproszenie na ślub mój i Maciaka. Zazdroszczę hi hi. Wieczorem prześle Ci maila.